Marine and Offshore units often operate in difficult environments, where they are subject to constant wave action. Given these circumstances, unit owners require their assets to be built, maintained and upgraded to the highest possible standards of safety, cost-efficiency and sustainability. To improve safety, Bureau Veritas invests in research and development, helping our experts gain a deeper knowledge of maritime conditions, and improve our suite of software programs. This technology enables us to carry out complex cutting-edge studies. Our research & development strategy is based on building a wide platform of knowledge and bringing together the best universities, ship owners, engineering and manufacturing companies and research institutes. One specificity of marine and offshore structures is that they are constantly subjected to waves throughout their operational lifetime. This, as well as the structure's interaction with floating units, is a key factor in marine engineering. As a consequence, hydrodynamic knowledge has been a topic of research and development for many years at Bureau Veritas, yielding cutting-edge tools and methodologies essential to efficient ship design and classification process. Although significant progress has been made over the past few decades, the hydrodynamic field is far from a closed topic. There is room for improvement on many critical points: non-linearities, forward speed, viscous effect, wave-current interaction and much more. For this reason, Bureau Veritas' main hydrodynamic software, HydroStar, is continuously upgraded, providing the industry with an ever more accurate and efficient tool. To overcome limitations inherent to HydroStar potential theoretical basis, a significant effort has been made in CFD (Computational Fluid Dynamics). Based on our OpenFoam technology, Bureau Veritas has developed and implemented FoamStar, a set of new features dedicated to marine application (improved wave generation and absorption, elastic motions, etc.). For this reason, a tremendous research and development effort has been underway to achieve an efficient, innovative and accurate numerical tool. Our goal was to develop a tool capable of handling any practical hydro-structure interaction issue, to best assess extreme or fatigue failure of floating units. For this reason, we developed Homer, a software concerned with hydro-structure coupling, HOMER is the leading software in the field of hydro-elastic structural responses of highly flexible structures (i.e., springing and whipping of ultra large container ships). Another important field for research and development is the optimization of structural hull monitoring systems. An innovative approach was recently developed by Bureau Veritas, that allows assessment of hull girder loads (which cannot be directly measured) and stresses on any number of structural details (for which exhaustive physical instrumentation could not formerly be carried out), with a limited set of deformation sensors. 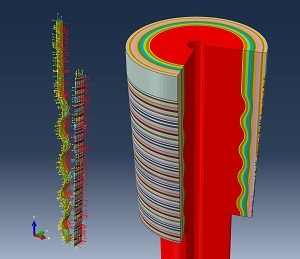 In combination with accurate hydrodynamics and hydro-structure interaction simulations, a precise estimation of a unit’s structural capacity is equally important for verification of its structural integrity. Therefore, Bureau Veritas has developed advanced methods and tools to evaluate structural strength against different failure modes, with a particular focus on fatigue, crack propagation and fracturing. The outcomes of our work have been improved practices and rule criteria for strength assessment. Our research results are disseminated, in order to maintain and increase the overall expertise of the marine and offshore industry. This is done in cooperation with universities, research centers, and industry institutions, through the participation in national and international research and development projects. An increasing number of floating units are moored around the world. FPSOs, FSRUs, semi-submersibles, TLP, buoys, spars and more have permanent mooring systems that operate without interruption in the harshest environmental conditions. Associated with all convex applications, such as supply vessels, offloading operations (buoy, tandem, side-by-side), dynamic positioning, etc., mooring activities represent a challenge that offshore designers face daily. As a classification society, Bureau Veritas continuously improves its knowledge. In the mooring field, we have added new methodologies and tools, including ARIANE, Bureau Veritas' state-of-the-art mooring software. Thanks to feedback from hundreds of users, our philosophy is to be and to remain at the forefront of mooring technology. Benefiting from our large network, this software is distributed and supported worldwide. Initially dedicated to large floating units, Ariane 7.1's last upgrade is compatible with most marine and offshore operations. Motivated by Ariane's success, Bureau Veritas continues to invest in anticipating industry needs, participating in major joint-research projects, sharing our experience at conferences, and compiling our knowledge for future releases. Sloshing may be defined as the violent behavior of liquid contents in tanks subjected to external ship motions at sea. Sloshing represents one of the major factors in the design of LNG fueled ships, LNGC, FSRU and FLNG. Sloshing loads can be extreme and require careful investigation before construction to ensure the design strength of the tanks is sufficient to withstand the expected sloshing loads for the expected maritime conditions throughout the ship’s lifespan. 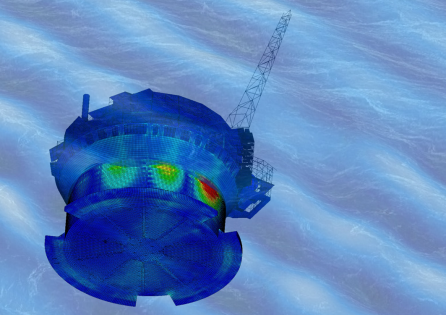 Advanced seakeeping analysis accounting for coupling between seakeeping and liquid motions inside tanks (HydroSTAR software). 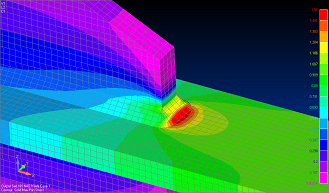 Sloshing analysis – CFD calculations (OpenFOAM software). 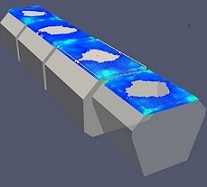 The objective of CFD numerical sloshing simulations is to provide independent verification of sloshing effects on cargo tank walls, evaluate the representative design loads on ship inner-hull structures and provide fluid velocities and accelerations at the pump mast location for the strength assessment. Moreover, Bureau Veritas has developed a dedicated plug-in called “Dynamic Probes” that provides complete information on the sloshing events over the tanks’ boundaries during the complete simulation. Sloshing model tests – Statistical post-processing. Based on Bureau Veritas’ own sloshing model testing experience, we carry out independent statistical post-processing of sloshing model tests. Structural assessment for plates and stiffeners according to Bureau Veritas rules. Taking advantage of the experience (experiments and CFD calculations) gained in prediction of internal liquid motions within LNG tanks, Bureau Veritas has developed a consistent methodology for anti-roll tanks, accounting for the calculation of lashing forces. Asset Integrity Management is at the heart of our business. It is the reason why we have developed methods and tools with the objective of implementing and managing Inspection, Maintenance and Repair (IMR) plans for new and existing offshore units (i.e., FPSOs and fixed structures). Risk-Based Inspection focuses on the most critical structural components while making sure that performance criteria regarding safety and the environment are met throughout the unit's service life. Bureau Veritas proposes customized solutions, including qualitative and/or quantitative approaches for corrosion and fatigue issues. If required, Risk-Based Inspection solutions may also include cost optimization. VeristarAIM3D is our new-generation asset management system powered by Dassault Systèmes’ 3DEXPERIENCE platform. Based on a digital twin of your asset, it acts as a single source of information for asset managers, automatically updating inspection and maintenance data, and offering the ability to simulate the impact of modifications. Quantitative risk methods to evaluate design safety levels. The main technical topics are new material and assembly technologies (composites, adhesive joints), collision, fire safety, evacuation, gas dispersion and explosion, dynamic stability and maneuverability on waves. Simulation-based ship energy efficiency analysis methods, based on Bureau Veritas’ SEECAT numerical tools. The most recent developments include the application of energy analysis, engine models and specific components for LNG carrier studies. 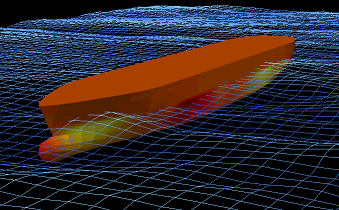 Our energy simulations are coupled with advanced hull and appendage hydrodynamic analyses using CFD, to optimize the hull and propulsion train, including wave performance. Assessment methods dedicated to marine renewable energy (floating offshore wind turbines, tidal turbines, wave energy converters, ocean thermal energy conversion, multi-use offshore platforms), loads due to marine environment, component reliability and certification procedures. Lightweight structures become a major issue for shipbuilding industry and the use of composite materials is essential to overcoming this challenge. Additionally, the development of hybrid structures, such as steel-composites, requires new assembly methods as bonding. To address these new challenges, Bureau Veritas Marine & Offshore participates in European and international research projects in order to improve existing rules and develop new Guidance Notes. Bureau Veritas Marine & Offshore is involved in a variety of research projects concerning large-length fiber-based ships, composite patch repair, composite propeller, tidal turbine blades, and fatigue and ageing of adhesive joints. Check here our participation to Qualify, a collaborative project to study and understand adhesive bonding of composite parts to steel structures.